Every day I enjoy taking a walk throughout my neighborhood, especially on a sunny day. However, during this time of year, my walks become a little cooler and there’s less sunshine outside. But when I stroll through my neighborhood on October 20, I will consider the importance of that walk. Every year, World Osteoporosis Day is October 20. It is a yearly campaign organized by the International Osteoporosis Foundation (IOF) to raise awareness for the prevention, treatment, and diagnosis of osteoporosis and other metabolic bone diseases. More than 90 countries raise awareness with activities by national osteoporosis patient societies. Why is my daily stroll so important? My daily walks can also help raise awareness among our readers about osteoporosis, which affects over 40 million people in the U.S., especially postmenopausal women. It is quite well known that a sedentary lifestyle will reduce bone mass. Regular exercise, such as leisurely walking, can reduce your risk of osteoporosis by stimulating activity in bone-building cells called osteoblasts. So daily walks are something I’ve made a high priority, especially after reading a study published in the Journal of Bone and Mineral Metabolism in 2004 solidified the importance of exercise to reduce the risk of osteoporosis. This study observed 50 postmenopausal women between the ages of 49 and 75 with osteoporosis or osteopenia. Thirty-two women participated in a daily outdoor walking group, and 18 women were in the control group. The exercise group walked for one hour daily, or about 8,000 steps, four days a week for a year. Urinary cross-linked N-terminal telopeptides of type 1 collagen levels declined after month three of the study and continued to decline until the last month. The results proved significant in the prevention of lumbar bone mineral density. Another bonus of my daily strolls – at least when there’s still lots of sunlight – is the vitamin D I get. Lack of sunlight is associated with vitamin D deficiency, which is known to be a problem among people with osteoporosis. Vitamin D deficiency is also known to increase fracture and fall risks, and it is a prevalent issue behind muscle weakness. Furthermore, high blood levels of vitamin D3 (cholecalciferol) are linked with lower fracture rates. Vitamin D’s role in osteoporosis prevention has also been heavily published in medical journals. 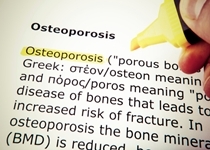 An abstract in Annals of Medicine, for example, established the osteoporosis and vitamin D connection with a meta-analysis of four randomized and placebo-controlled trials. The meta-analysis found that 800 IU of vitamin D3 daily in older adults over the age of 65 prevents about 30% of non-vertebral or hip fractures. It is best to take daily vitamin D3 supplementation when regular sunlight cannot be obtained. I recommend a minimum of 800 to 1,000 international units (IU). Foods containing vitamin D include shrimp, sardines, cod, and eggs. What are other ways to reduce your risk of osteoporosis? It would be wise to give up smoking and limit your alcohol consumption; smokers and heavy alcohol drinkers are both known to have a greater risk of fracture as well. Other weight-bearing exercises for osteoporosis prevention include hiking, stair climbing, and dancing. Light weightlifting, water exercises, and flexibility exercises, such as yoga, stretching, or tai chi, may also help prevent injuries associated with osteoporosis. Murray, M., et al, The Encyclopedia of Natural Medicine (New York: Atria Paperback, 2012), 844, 846–847. Yamazaki, S., et al., “Effect of walking exercise on bone metabolism in postmenopausal women with osteopenia/osteoporosis,” Journal of Bone and Mineral Metabolism 2004: 22(5): 500–508. Holick, M.F., “Optimal vitamin D status for the prevention and treatment of osteoporosis,” Drugs & Aging 2007; 24(12): 1017–1029. Holick, M.F., “Vitamin D: important for prevention of osteoporosis, cardiovascular heart disease, type 1 diabetes, autoimmune diseases, and some cancers,” Southern Medical Journal October 2005; 98(10): 1024–1027. Vieth, R., “The role of vitamin D in the prevention of osteoporosis,” Annals of Medicine 2005; 37(4): 278–285. Gerace, J.E., “Exercise for Osteoporosis,” WebMD website; http://www.webmd.com/osteoporosis/features/exercise-for-osteoporosis, last accessed October 15, 2014. “What Is Osteoporosis?” NIH Osteoporosis and Related Bone Diseases National Resource Center web site; http://www.niams.nih.gov/Health_Info/Bone/Osteoporosis/osteoporosis_ff.asp, updated January 2011. “What is World Osteoporosis Day?” World Osteoporosis Day web site; http://www.worldosteoporosisday.org/about, last accessed October 15, 2014.